David Weitzman calls himself a cosmic jewelry artist. For many years he has been studying the Kabala, Tibetan Buddhism, the ancient Egypt and the mysterious Atlantis. This gives him an inspiration for his marvelous jewelry, all of which have deep symbolic meaning and do something to the person, who wears them. "I want to create something that unites people instead of divides them, something that transcends religion." 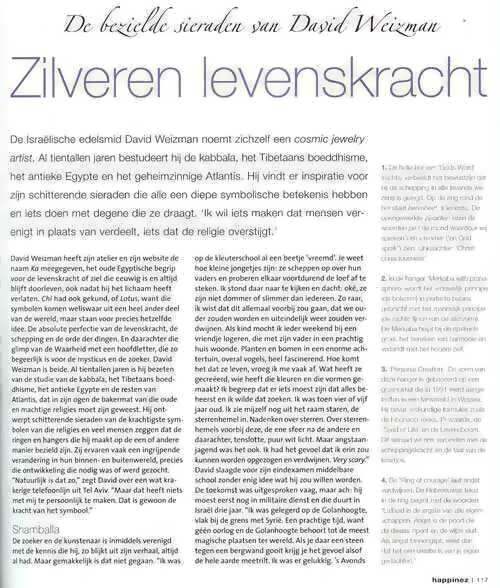 David Weitzman has named his studio and his website Ka, an ancient Egyptian concept for life force or soul, which has existed eternally and always continues to exist, even after it has left the body. Chi or Lotus could also have been options because - although these symbols come from a totally different part of the world - they stand for precisely the same idea: The absolute perfection of life force, the creation and order of matter. And beyond that, a glimpse of the Truth with a capital T, which is so desirable for the mystic person and the searcher. David is both. For many years he has been obsessed with studying the Kabala, Tibetan Buddhism, the Ancient Egypt and the remnants of Atlantis, which in his opinion must have been the cradle of the old and powerful religions. 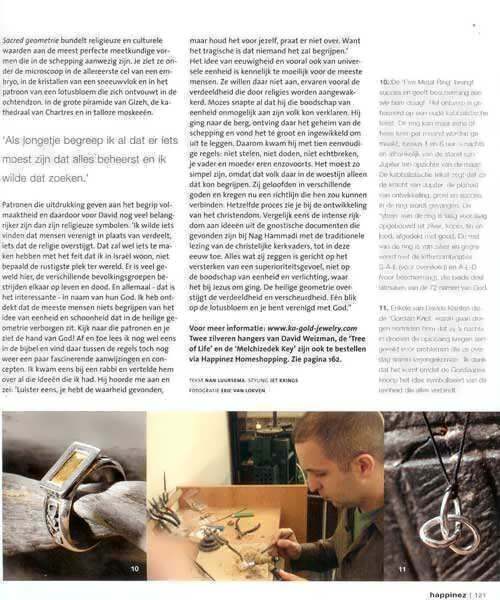 He designs dazzling jewelry based on the powerful symbols of these religions and many people claim that the rings and pendants that he creates somehow contain spirituality. They often experience a sweeping change in their inner and outer world, precisely the change they needed or were looking for. "Of course this is so," says David over a somewhat creaky telephone line from Tel Aviv. "But this has nothing to do with me personally. This is simply the power of the symbol." The searcher and the artist are in the meantime at peace with a knowledge that he has always possessed, this is what emerges from his story. But it wasn't always easy. “I was already a bit 'strange' in kindergarten. You know how young boys are: they brag about their fathers and are always trying to outdo each other. 1. The concave ball of 'God's Word' (right) represents the consciousness that had entered all living beings at the time of Creation. On the ring, around the ball is the word Beresheet (Genesis). The cutaway sides show the words Pe (the mouth with which we speak) and Vayomer ('and God spoke'). Left back: Christ Consciousness. 2. In the pendant Merkaba with Prana sphere the female essence (the concave form) is in perfect balance with the male essence (the straight lines of the star). The Merkaba contributes to spiritual development, achieving harmony and connection with the higher inner self. 3. Personal Creation. The form of his pendant is based on a grain circle that was discovered in 1991 in a wheat field in Wessex. It contains scientific formulas, such as the Fibonacci sequence, Pi Value, the Seed of Life, and the Tree of Life. This piece of jewelry wants to connect us with the forces of creation and the cosmic language. 5. In the Mobius Ring there is no distinction between the outer side and inner side. This symbol of oneness and wholeness is often sold as a friendship or wedding ring. 6. On the band of the Genesa Crystal it says: 'The soul has three paths – man, freedom and light'. This derives from the Emerald Tablet of Thoth. This form attracts energy, purifies and harmonizes it and then emits it. 7. The Four Winds Ring is intended for those looking for the truth in their journey through life. One of the engraved phrases says: 'The further we travel, the less we know' and it comes from the Tao Te Ching. 8. The wide silver Jerusalem Ring with the cutout pattern from the Seed of Life and around it the Hebrew words Uro (foundation, basis) and Shalem (whole) that together comprise the word Jerusalem. 9. The Dragon Pendant symbolizes oneness. It is a combination of the Gordian knot and Ouroboros, the snake that bites its own tail eternally. I woke up very frustrated and continued to be frustrated for three years. I visited dozens of psychics in the hope that someone would be able to explain my dream, but they all turned out to be charlatans." In 1998 a friend visited David. The friend told him that a very strangely behaving hobo was wandering on the street in front of his house. "We went together to just check it out and as soon as I opened the door, the man began to shout at me: 'You are searching for a green stone!' He was very confused, I hardly understood him. He also shouted things like: 'I once had gold, now I only have iron.' He used alchemist concepts to express the fact that he traded his treasure for rubbish. Earth relates to life 'Above', how the soul (Ka) detaches from the body, in short – everything! This is the oldest mystic scripture and perhaps the most important one. Many people claim that the rings and pendants that he creates somehow contain spirituality. I began to read and felt myself connected with ancient knowledge. My life began to be more fluid and things began to develop quickly. When I looked at a concept, I was able to understand it immediately. I then came up with the idea of jewelry. I felt the need to express these forms outwardly, to realize them. My first item was the Merkaba – a two-dimensional Star of David – which I gave it away to a friend, who was an addict, a hopeless junky. Two weeks later he quit drugs and cigarettes and even became a vegetarian. I personally wear the Kabalistic Key of Sureness, which is also a very interesting symbol. It stands for the idea that whatever I do does not stem from my own ego, but from a higher being. of an embryo, in the crystals of a snowflake, and in the pattern of a lotus flower that unfolds with the morning sun. You see it also in the great pyramid of Gizeh, in the Cathedral of Chartres and in many mosques. As a young boy I understood that something must command all this and I wanted to look for it. difficult for most people. They want to have nothing to do with it and they mainly perceive the division fanned by all religions. Moses understood that he would not be able to explain the message of oneness to his people. He climbed the mountain, received the secret of the Creation there and thought that it is far too overwhelming and complicated to explain. That's why he came down with 10 simple commandments: Do not steal, do not kill, do not commit adultery, honor your mother and father, etc. It had to be made simple, because his people in the desert could not understand anything else. They believed in different Gods and now they were given guidelines for uniting. You see the same development in Christianity. Compare the immensely rich ideas that come from the Gnostic documents found in Nag Hammadi with the traditional preaching of the Church Fathers up until this century. Everything they preached was focused on strengthening a sense of superiority, not on the message of oneness and enlightenment, which was, what Jesus preached. Sacred geometry transcends division and schisms. One glance at the lotus flower and you are one with God." Two silver pendants designed by David Weizman, the Tree of Life and the Melchizedek Key, can be ordered through Happinez Homeshopping. 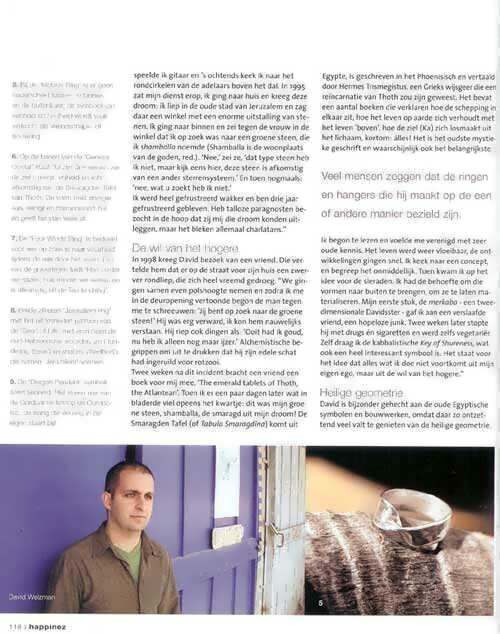 See page 162. 10. The Five Metal Ring brings success and protection to its wearer. 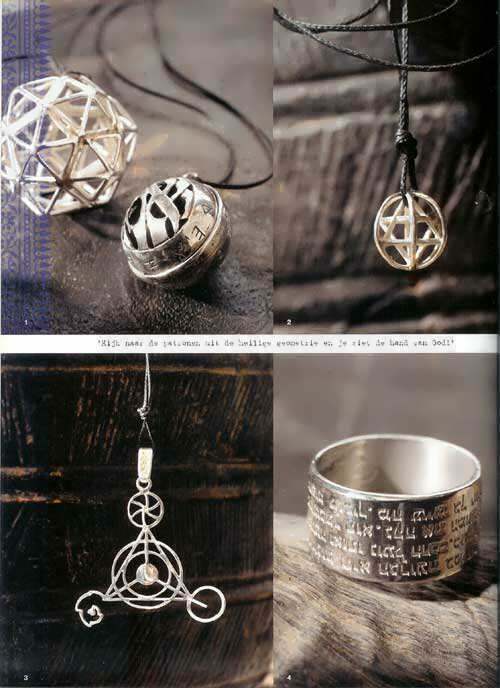 The design is based on an old Kabalistic text. This ring can be made only one or two times per month, between 1:00 and 06:00 at night and depending Jupiter's position with respect to the moon. The Kabalistic text says that this way the ring can capture the power of Jupiter, which is the planet of development, growth and success. The ‘stone’ in the ring is built up layer-by-layer out of silver, copper, tin and lead, and covered with gold. 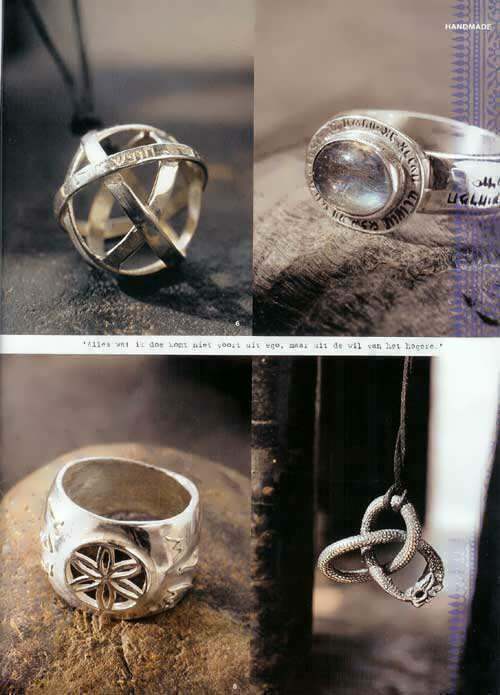 The rest of the ring is silver and engraved with the letters S-A-L (for abundance) and A-D-L (for protections). Both are part of the 72 names of God. 11. Some of David's clients that wear the Gordian Knot have told him that in their dreams at night they find the solutions to problems they had encountered during the day. "I think that happens because the Gordian Knot symbolizes the idea of oneness that connects everything."